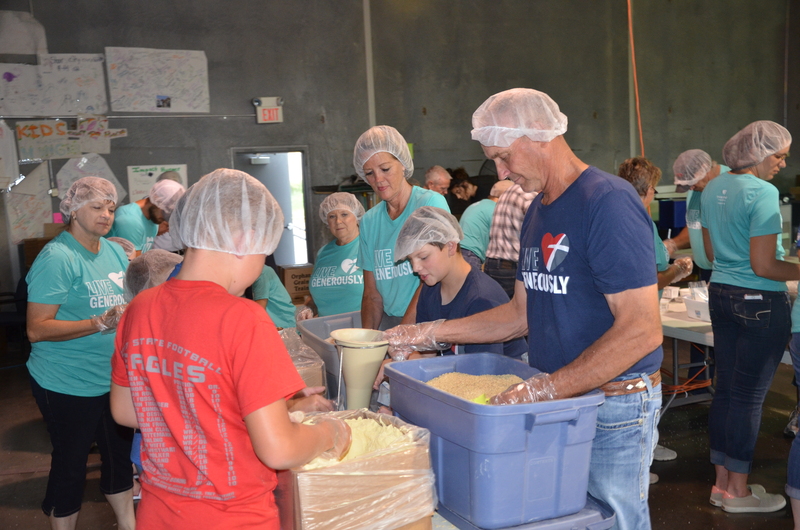 For I was hungry and you fed me – Matthew 25:35. 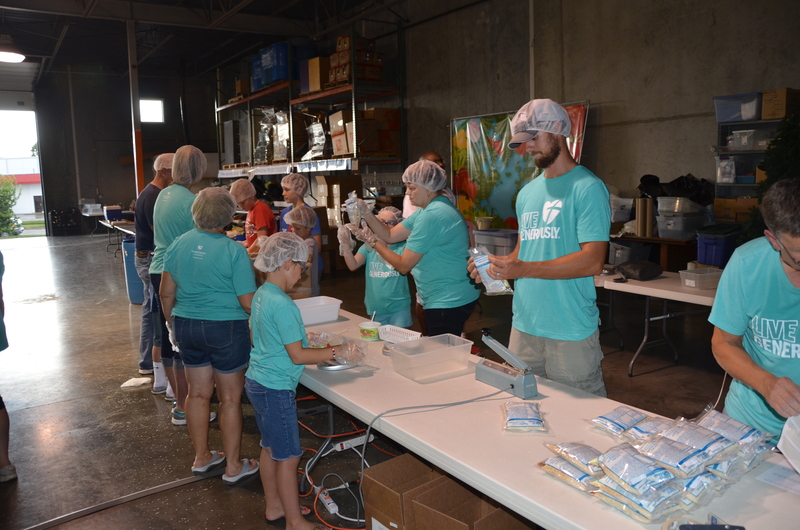 This Feed the Hungry Mission Project was to live this Bible verse. 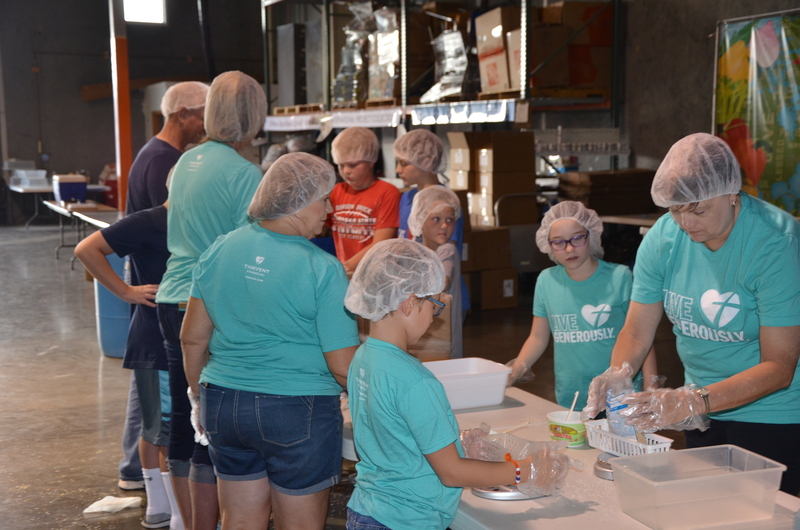 During the month of June, MLC members donated funds to be used in packing Mercy Meals at Chapter 25 in Lincoln, Nebraska. 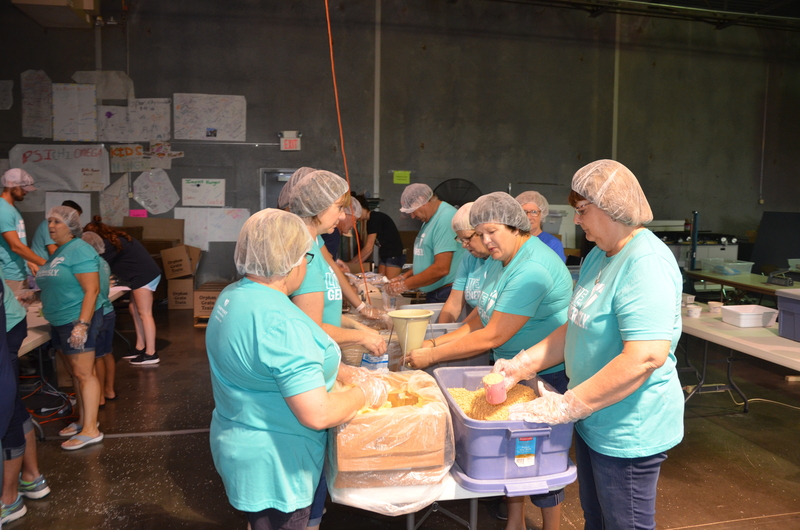 In July we coordinated volunteers and the date of July 30 was chosen to travel to the Chapter 25 warehouse in northwest Lincoln. 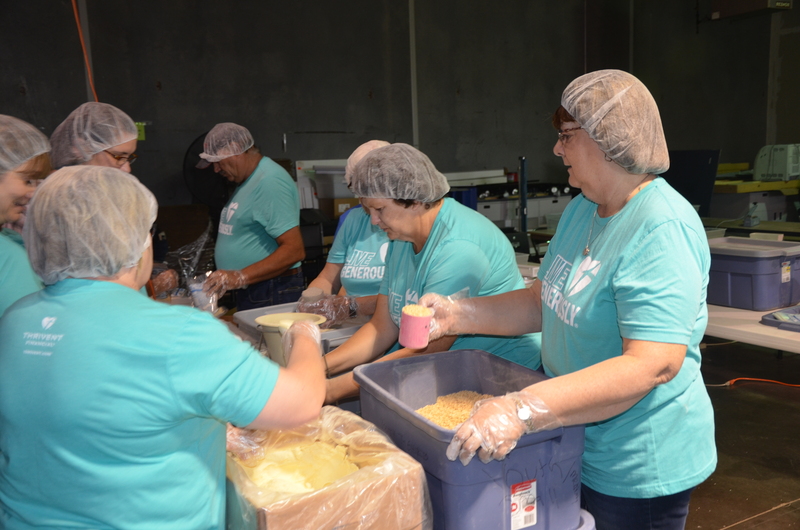 Our Thrivent Action Team volunteers was a hard-working and fast-paced group packing 6,480 meals for the hungry in less than one and a half hours! What’s in a package of food? 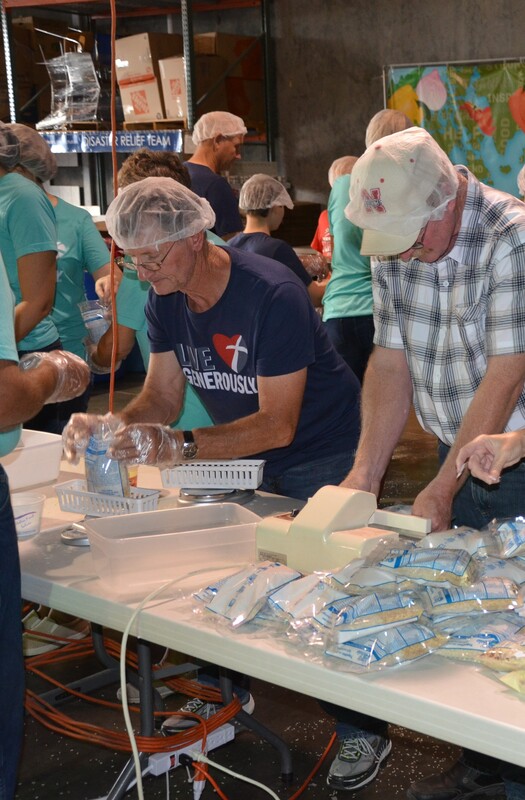 Sometimes referred to as a “Mercy Meal”, a package consists of ingredients formulated by food scientists to provide a rich source of easily digestible protein, carbohydrates, and vitamins needed by an undernourished child’s body and mind. 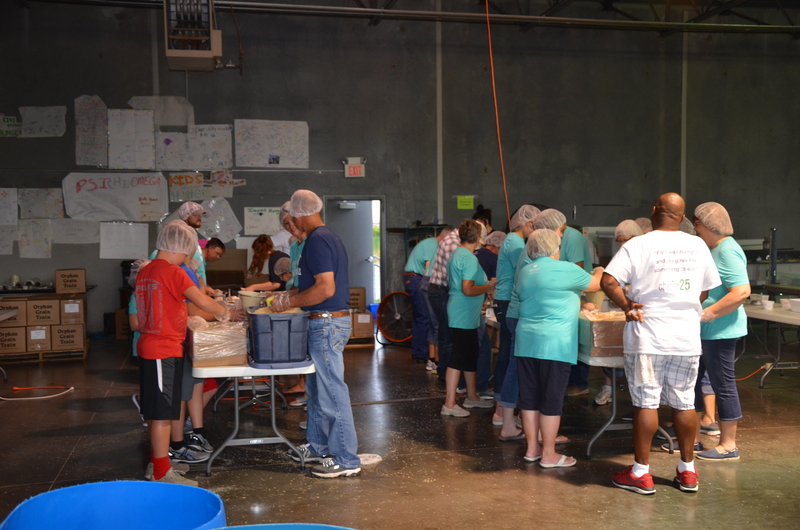 One package feeds six people by utilizing a pan and water. 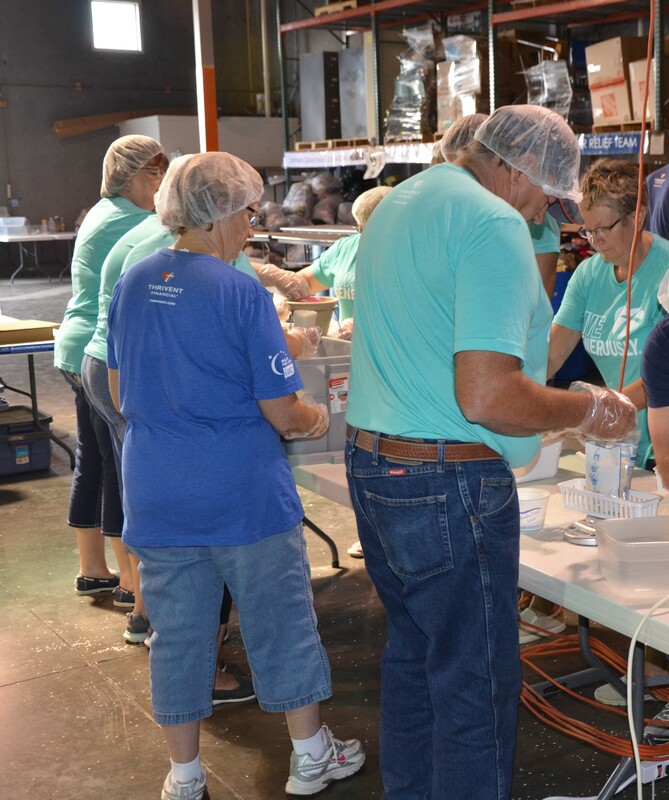 Workers measured out a scoop of 6 dehydrated vegetables, a scoop of chicken flavoring with added 21 vitamins & minerals, a cup of fortified crushed soy, and a cup of high-quality white rice. 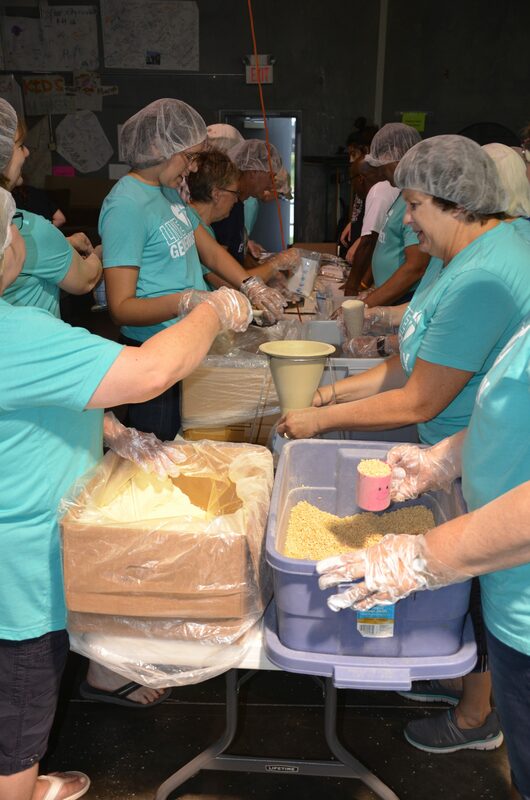 Positioned under the funnel is a bag ready to receive the four measured out ingredients. Scoop, measure, dump…REPEAT. 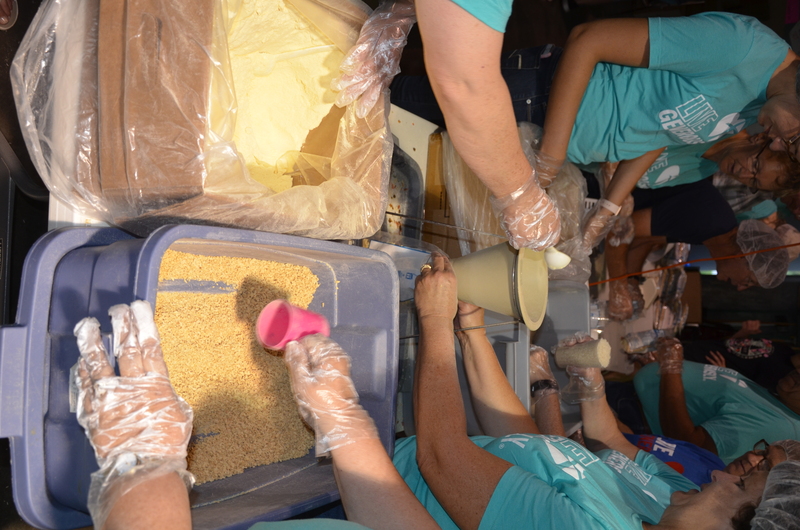 Scoop, measure, dump… REPEAT! The bag is then weighed. Workers may need to add just a bit of rice or take some out to get the weight to be just right! 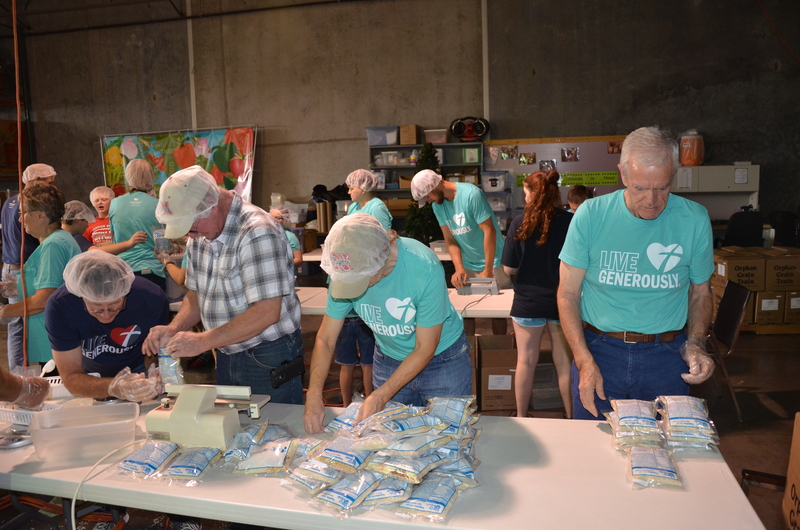 Each of the two separate packaging lines had a two stations to seal the bags shut. 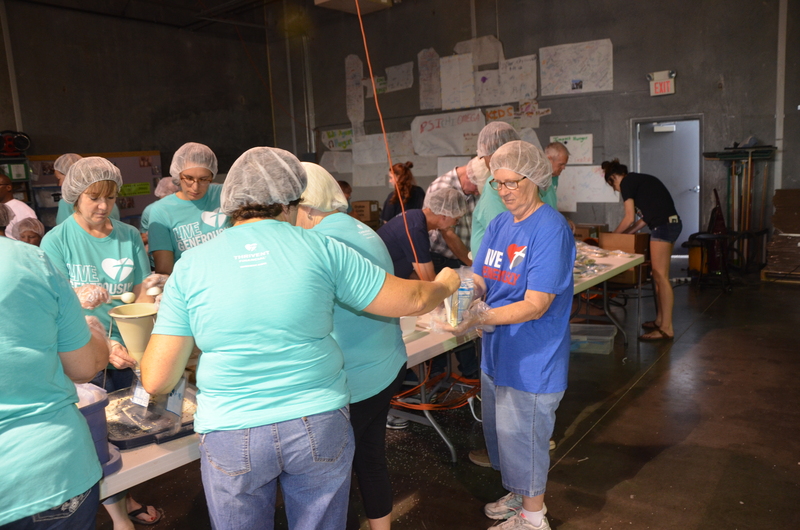 Labels are applied to the bags and packed into boxes. 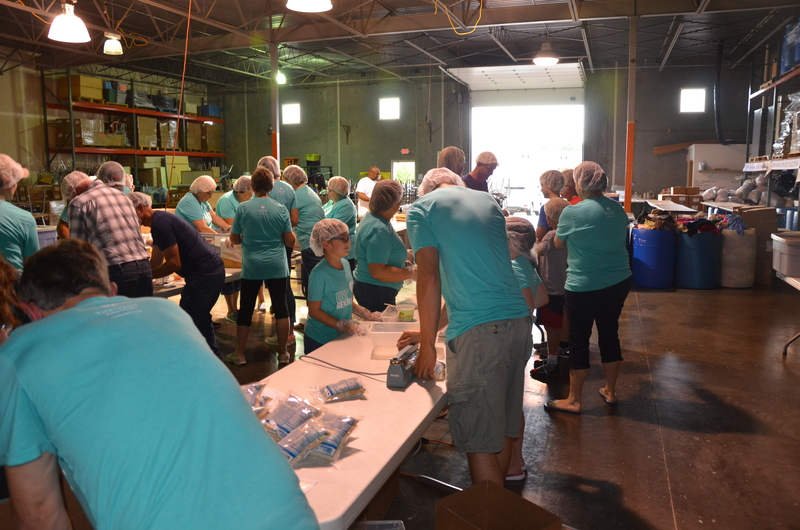 A few of our volunteers handled the boxes and re-filling of the ingredient tubs. Weigh, seal, label…REPEAT! 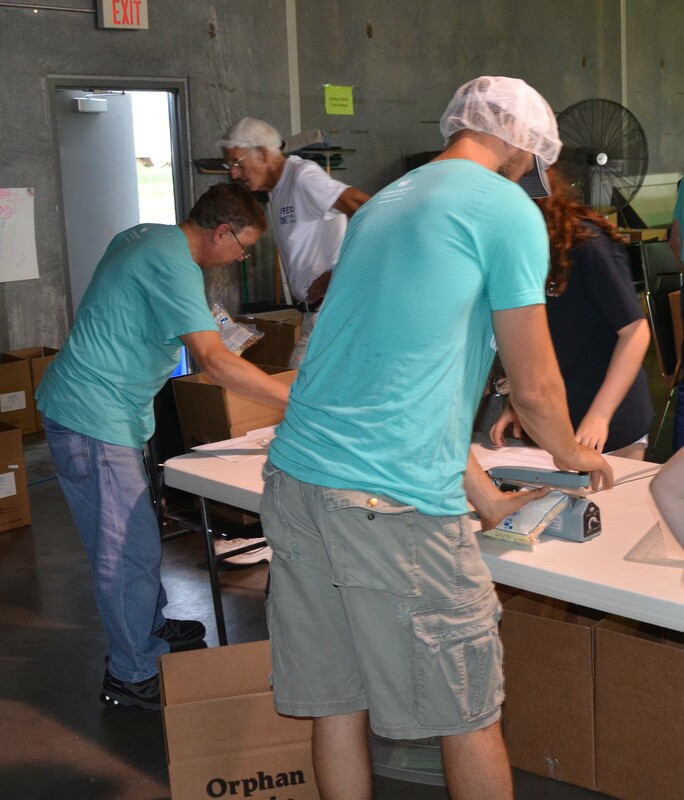 Weigh, seal, label…REPEAT! Like a well-oiled machine the job was completed in a short time! 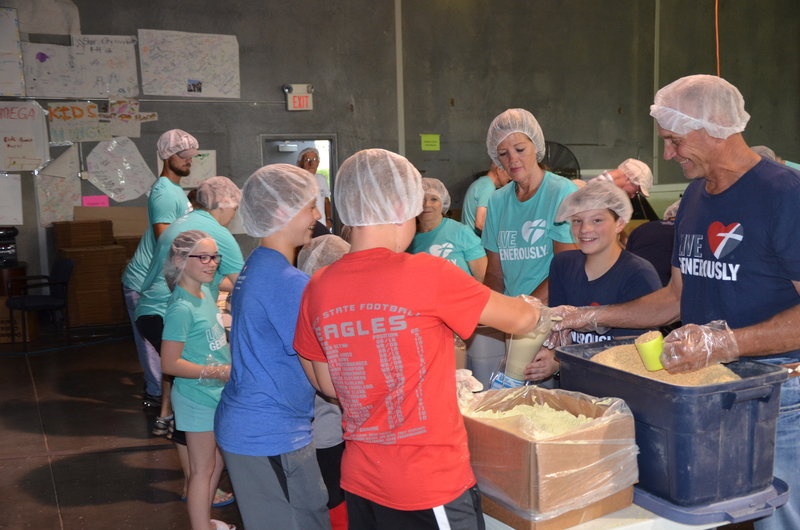 A total of $2,073 was used to pack the 6,480 meals. The end result to those who are hungry…Priceless! MLC – Living Chapter 25 – To the Glory of God!